What a weekend for baseball in Toronto. If you were fortunate enough to score a ticket to any of the games this past weekend, you definitely got your money’s worth. After several nail-biting and heart-stopping moments, the Blue Jays emerged with three of four victories against the Orioles. Both teams combined to hit 21 home runs over that four game set as it was a veritable feast at the plate. These four games saw many starting pitchers’ ERA’s balloon and a bullpen nearly collapse on several occasions. All in all … not a bad way to finish the weekend against one of the unexpected juggernauts in the American League. If this four game series taught us anything, it’s that the Baltimore Orioles are no joke and should be taken seriously. Entering this season, most had already written them off as a fifth place team; but Baltimore’s lineup is relentless, as evidenced by the 14 home runs they hit in that series. Chris Davis was particularly lethal as he homered in every single game against the Blue Jays. Davis’ lore only continues to grow as one of most dominant active hitters against the Toronto Blue Jays. As Jason Grilli said, this series between the Jays and O’s was a heavyweight fight; there were no easy wins, as three of the four games were decided by only a single run. The Orioles should no longer be underestimated and will be a formidable foe for the Blue Jays this season. One of the highlights of that weekend series was being able to watch Jason Grilli work himself into (and out of) numerous jams. His appearance on Sunday was a little more heart-stopping than Saturday, but he recorded the final out in both cases. Grilli has really provided some much-needed stability in the back end of the Blue Jays bullpen, as the bridge to Roberto Osuna has become increasingly unstable. One can’t say for sure whether Jason Grilli has discovered the fountain of youth, but he’s pitching like a rejuvenated man. I had a bunch of Baltimore Orioles fans infiltrate my mentions over the weekend about Grilli’s exuberant fist pumps after the win. Yes, it wasn’t the World Series, but that’s just who Jason Grilli is. Plus, any time the Blue Jays bullpen doesn’t melt down, I’d say it’s a cause for celebration. Grilli was kind of unexpectedly thrown into the setup man’s role over the weekend, and I’m not sure if that speaks more to the lack of options in the bullpen or Gibby just trusts Grilli. 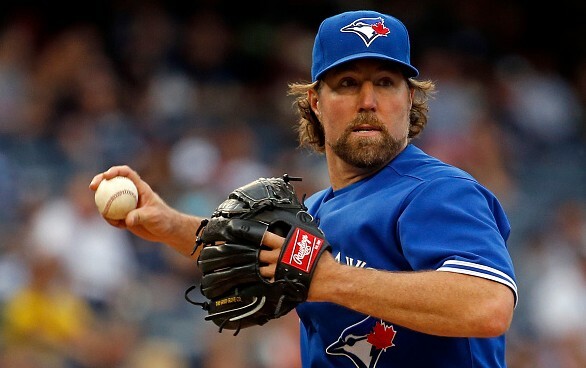 If we’re comparing Jason Grilli to someone like LaTroy Hawkins of last year, I trust Grilli far more in high leverage situations than I would Hawkins. At times, I forget Jason Grilli is 39 years old and can still throw 94 miles per hour. If anything, Grilli has been a calming force in the Blue Jays’ bullpen and now makes the bridge to Roberto Osuna a little more stable. Remember how the Blue Jays had many perpetually worried about their ability to score runs? It may have had something to do with the calibre of starting pitching they faced, but the Blue Jays absolutely feasted off the Orioles’ pitching staff this weekend. The Blue Jays truly did look like the 2015 team of yore; with their ability to break out for a boatload of runs at any given moment. Also of note, the Blue Jays didn’t completely rely on the long ball, as they managed to manufacture runs on several occasions. Keep in mind, this all took place as Jose Bautista – one of their best hitters – was on the bench most of the weekend. Instead, Edwin Encarnacion picked up the slack and provided more than enough offense single-handedly. I feel like I say this after every series in which the Blue Jays score a lot of runs, but I don’t think they’re entirely out of the woods just yet. These four games provided some very encouraging signs that the Blue Jays’ bats may have finally woken from their long slumber this season.